Abigail Chaplin, a young mute girl, has lost her father to the parliamentarian cause. But with her family now in reduced circumstances, she is forced to work as a servant at a royalist household – the estate of Lady Katherine Fanshawe. Shadow on the Highway is an exciting peek into the English Civil War from both sides of the fighting as well as from the viewpoint of those left at home to fend for themselves. I was impressed with how the author was able to highlight the greed and corruption on both sides of this coin and how this English war ripped apart families and communities. No one seems better equipped to represent this dividing of loyalties and the chaos that swirled through England during this time than young Abigail, a girl caught between the parliamentarian leanings of her family and the royalist household she finds herself ensconced in. Abigail was by far my favorite character. You can't help but feel terrible for all she has had to go through: the guilt she feels over causing the fire that destroyed her family's home and the belief that the illness that caused her deafness was retribution for her actions; the sadness over losing her father and the hard life this left her mother and siblings in; the feeling that she has to stick it out and take whatever abuse she receives at the Fanshawe household because she has very few choices in life and needs to do what she can to help her family. With all of this she is stuck in the middle of all the varying beliefs and dangers around her, made to keep secrets from everyone and forced to find a way to survive, and all without being able to hear a thing! It was remarkable seeing her use her other senses to navigate the world around her and I got a great delight when she would let her anger and jealousies surface and act out in what little ways she could safely do. My least favorite character would have to be Lady Katherine Fanshawe. She was bossy, stubborn and used poor Abi to get her way without taking into consideration what problems her demands might cause. Even when we see her in a more sympathetic light - seeing her being used by first her step-father and then the manor's overseer, the physical abuse she is made to suffer through for not doing what she is told, etc. - Katherine would turn around and threaten or cajole Abi into doing something or helping her to do something that could get them both into a lot of trouble. By the end she does show herself to be a better, more humble person that initially expected but I would have preferred that to happen a lot sooner. Being that this is the first in a trilogy and the final book is slated to be from Katherine's perspective I am hoping she will redeem herself in full when she gets to tell her own story. Possibly the most fascinating aspect of Shadow on the Highway for me was the introduction of aspects of the English Civil War I had never heard of before. For example, The Diggers were a group of Englishman during this time who tried to live in what we would now call communes, living off the land in a state of equality for all and the sharing of all goods and properties. By having Abi's brother Ralph (who will be the centerpiece of the second book in this trilogy) advocating for a Digger's community on their village's common land we the reader are able to walk into this fascinating segment of history and see how these radical thinkers of the time tried desperately to make a place for themselves in a country placing so many restrictions and demands on their freedom. One of the aspects of historical novels I cherish the most are the historical notes many authors put at the back of the book, letting the reader know where they have stuck to the true events discussed and where they have embellished to advance the story in some way. Deborah Swift's historical notes are delightful and prompted me to want to learn more about the English Civil War, the real life Lady Katherine Fanshawe, the 17th century advancements in helping non-hearing children communicate and so much more. This rounding up of the themes and characters discussed in the story really solidified the story for me and has me excited to read the next two books in the trilogy. Being that this is categorized as a YA novel I think it will appear to young readers just learning about the English Civil War as well as readers well versed in this era. I have enjoyed Deborah Swift's writing before and this was no exception. I very much look forward to the next two books in this trilogy! I think it's beautiful! I love the sumptuous red dress and the swirling gold around the edges. I am assuming the woman on the cover is meant to be Lady Katherine and I think it represents her well. 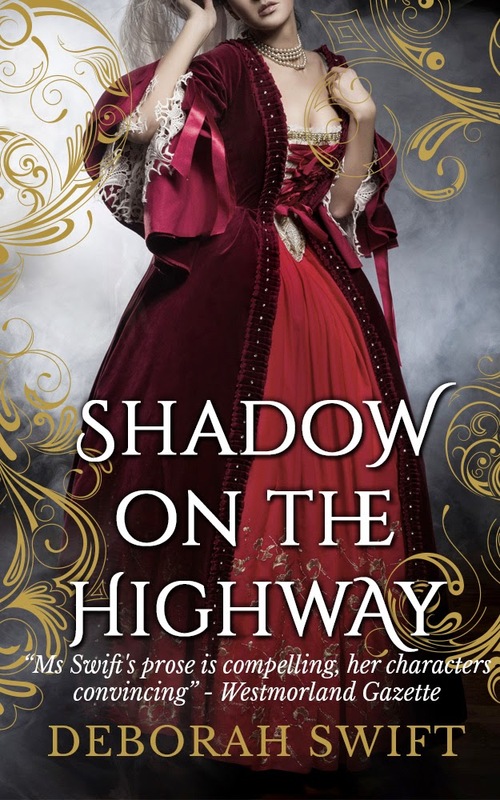 Thank you to Amy at Historical Fiction Virtual Book Tours for providing me with a free copy of Shadow on the Highway in exchange for an honest review! Be sure to continue below for more information about the author and the book tour. studying for an MA in Creative Writing in 2007. She lives in a beautiful area of Lancashire near the Lake District National Park. 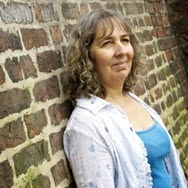 She is the author of The Lady’s Slipper and is a member of the Historical Writers Association, the Historical Novel Society, and the Romantic Novelists Association.